Q: What is VPN service? A．Our service is designed to accomodate everyone. Our service puts emphasis on user friendly and economical service.created for assigning new IPs to allow access to IP restricted areas overseas. Be sure to understand the purpose of VPN is not to for file sharing, it's not possible to share files by getting 2 accounts for the pupose of passing files. What restricitions on user configurations are there? A．For best operation, VPN Service requires the following minimum hardware. If you use a LAN connection with an overlapping IP address, an error message will be incurred. PPTP connections use protocol number 47(GRE) and TCP port number 1723. It's also necessary to set up to PPTP multi- pass. Depending on the rooter brand, VPN PassThrough may be used. L2TP uses UDP port number 1701,500,4500. SSTP/OPENVPN VPN uses port number 443. In use of PacketiX VPN. You can choose a port number from 443, 8888,992 (443 is for normal use) You may request a desired port number (not guaranteed) These configurations are necessary. Protocol number 47(GRE) may not be usable in public wireless areas such as Mc Donald's, airports and those services provided by cable TV. In such cases, switch to L2TP,SSTP,OPENVPN or PacketiX VPN for service. Port 443 can almost always be used. A. SSTP is compatible with OSs from Windows Vista SP1, Windows 7 and later. PPTP/L2TP supports most OSs, OPENVPN supports most systems except smart phones and mobile phones. PacketiX VPN is only for Windows、Linux. Can I use with dial-up connections? A. 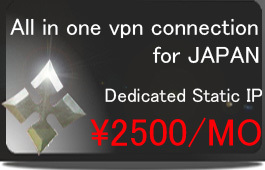 There are basically no restrictions with this VPN service. Optical fiber and ADSL broad band connections and dial-up connections such as ISDN and analog modems are all compatible. If you have a internet accessible environment at your company, you can access through, AIH and @FreeD or similar mobile access devices. A. For L2TP, there is no need to install registration. The shared key name is "ninja". SSTP can be used without any setting up as it uses the registration of the company Global Sign. Usually OPENVP needs both CA and client registration but with our service, client registration is not necessary. With our service CA registration is issued by us. The CA registration key can be downloaded from the control panel on our website after activating your account. PacketiX VPN is not required registration. I have already installed OPENVPN, where do I get OPENVPN's configuration files? A. You just need to download the configuration files and CA registration from our control panel after opening your account and keep them in the appropriate folder. How about guaranty of speed? A. There are no real guarantees. It depends on several things, including your connection configurations, the number of current accesses to our server and the specs of your computer. Are rates of speed different by countries? Are rates of speed different by countries? What about the monthly packet traffic volume fee? A．WinMX、Winny、Share、BitTorrent and similar file sharing software are prohibited as they cause trouble for other customers. Please refrain from their use. The purpose of this VPN service is not for file sharing so as a result after monthly limit of 100GB, service will be stopped. Tell me about restrictions of this service? *WinMX、Winny、Share、BitTorrent and similar file sharing software are prohibited as they cause trouble for other customers. Please refrain from their use. The purpose of this VPN service is not for file sharing so as a result after monthly limit of 100GB, service will be stopped. *Sending spam mail is prohibited. *Improper conduct within online games such as disturbing other users is strictly prohibited. *There is only one connection for each account. If more are needed, you must apply for each account. *For hacking and cracking and online bullying (mental abuse), violation of privacy, infringing on the right's of others, your account may be stopped immediately with no refund. *Authorities will be notified in the event of service users breaking laws and appropriate action will be taken. Is it possible to receive such radio programs as Radiko? A．TBS radio、Bunka Houso radio、Nippon Houso radio、Radio NIKKEI、InterFM、TOKYOFM、J-WAVE and others can be received. Information concerning cancellation How to cancell? A．Upon the expiration of your pre-paid period of usage, your account will be automatically cancelled. However, you will still be able to access the control panel. And you can conveniently recontract for service without re-registering at any time. Tell me about the limitations of support? A．Support is limited to set up of our service and in accordance to our written manual. A．The same SSL safety degree. I'm using Firewalls, are there any problems? A．If you have Firewalls installed, an alert warning may appear and you might not be able to use this service. So using PPTP encrypted connection, port number 1723 and GRE protocol number 47 are necessary or ask your firewall software company for details. In case of firewalls in your rooter you need to set up GRE and VPN Multipath Through. For L2TP, you need to use UDP 1701 port、500 port、or 4500 port .For SSTP/OPENVPN/PacketiX VPN use TCP SSL's port 443. It can be used in almost all configurations, set up may not be necessary. What can I do in the main control panel? Users can change and confirm account information and also change payment method. 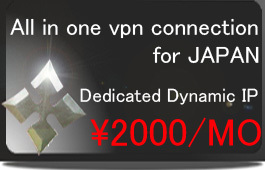 Users can choose among PPTP/L2TP/SSTP , OPENVPN and PacketiX VPN. Updated information will be sent to your -mail and can also be checked in your account's control panel. A．Yes , you can but you cannot change your user account. If you need to do so, send us an e-mail. We will send you a link to a special page for password management. If I forget my account ID and password, what can I do? A．From here, you can be reissued an account ID or password by registering your e-mail address. In the event of forgetting your registered address, you need to contact us by e-mail and a copy of your ID will be required. Is it possible to reuse my account ID? A．Once your accountID is issued, it can be used indefinitely. After your contract term expires, you will retain use of your account control panel and you can recontract at any time. Tell me what credit cards are acceptable? Are there other methods of payment other than credit card? A．Wireless bank transfer payments are also acceptable. The transfer fee is at your cost. A．Automatic bank account withdrawal is not accepted. What are end of service dates and billing dates? A．There are 1 month, 6 months and 1 year contracts beginning from the day your account is opened. You can always check the last day of service through your control panel. If you'd like to renew your contract, simply make a prepayment before the end of your current contract. A．No, no receipts are issued. You can keep your credit card statements or wireless transfer statements as a receipt. Are there any start-up or hidden costs? A．No, there are just the prepaid contract fee. Are there any automatic payment methods? A．No, there is only the prepaid contract method. Are there any eligibility limitations? A．Anyone living in Japan and who can agree to our terms is eligible. A．You can choose from credit card payment and bank account wire transfers. By using a credit card, you can get immediate access to your account and get started straight away (except Static IP services). Wire transfer users will achieve access to their accounts after one business day (waiting periods to begin on the first business day after weekends and holidays). Click on the Payment Here button for the information on where to send your payment. Continuous settlement by credit card. A．No, we do not offer a free trial period. What will happen if I register a mistaken address? A．In that case, we can't contact you so please contact us through our Contact Us button.